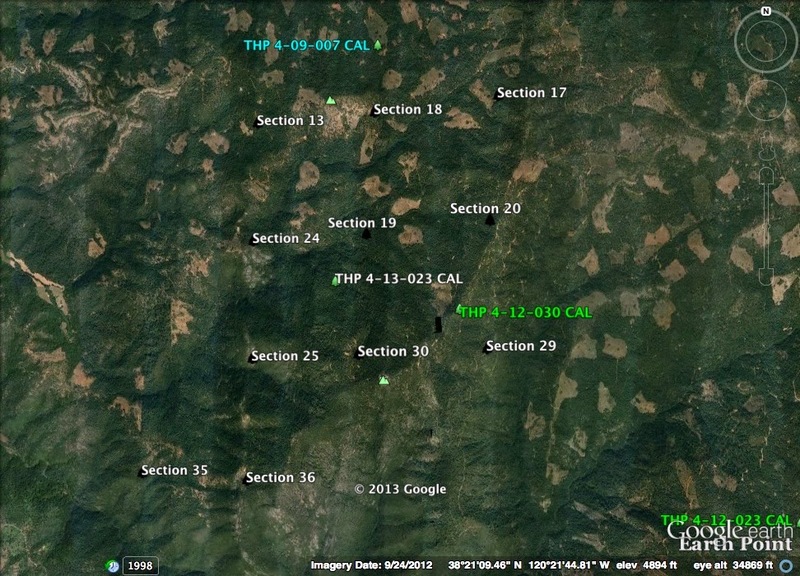 THPBlog: Sierra Pacific Industries to clearcut log out CA spotted owl habitat just north of Arnold, CA. Sierra Pacific Industries to clearcut log out CA spotted owl habitat just north of Arnold, CA. 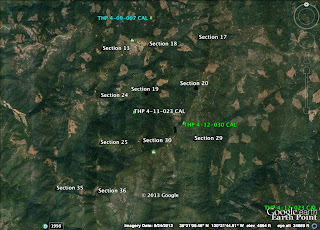 THP 4-13-023 CAL (L Fork THP) Sierra Pacific Industries, 621 acres; 85% clearcut, 7% commercial thin, 6% selection, 2% roadside logging. Upper Licking Fork (MD: T6N R14E Sec.13, 24, 25, 35, 36; T6N R15E Sec.17, 18, 19, 20, 29, 30). Winter operations, high erosion hazard, steep slopes up to 75%, 36 road drainage work sites, herbicides, 10 CA spotted owls within 1.3mi, goshawk territory, red hill soaproot, scattered large trees. Estimated public comment deadline: 12/18/13. This THP is 6 miles north of Arnold, CA and Highway 4 near the Licking Fork of the Mokelumne River at an elevation of 3,500 to 5,800 feet. Sierra Pacific Industries is planning a mostly clearcut tractor and cable logging operation in ponderosa pine, sugar pine, white fir, Douglas fir, and incense cedar forests. Tractor long-line yarding of trees is proposed on steep slopes over 65% in unit 187, and some limited tractor operations are proposed on steep slopes between 50 to 65% in areas with medium and high erosion hazard in units 179, 180, 187, 193, 3412 and 3260. They also are planning to use 2 landings inside a class III watercourse in units 179 and 208, 2 skid trails inside a class I watercourse in units 208 and 3250, and for access to a waterhole inside a class III watercourse in units 160 and 3416. 278 acres of so called “operational area buffers” are planned for some limited tree removal outside of unit boundaries, and for the construction of fire lines, tail holds, skid trails, site prep and to access landings, roads, etc. 36 road drainage sites are planned for work including rocking, dip construction, culvert repair and replacement, and water hole construction. The BLM has asked SPI to either drop or reduce the harvest level to a partial harvest for the Licking Creek CA spotted owl territory. The Licking Creek CA spotted owl territory is on BLM lands close to the THP units, so intensive logging by SPI could destroy core owl habitat. There is 1 goshawk territory nearby in section 14, and red hills soaproot was found adjacent to unit 3247. This THP is just to the south of SPI’s recently submitted So Schaad THP 4-13-022 CAL which will clearcut log 666 acres in the area. SPI reported 5 CA spotted owl territories in the area, although there could be up to 10 (CAL0044, CAL0006, CAL0048, CAL0050, CAL0047, CAL0058, CAL0056, CAL0049, CAL0046, CAL0054) spotted owl territories in the area according to our database. More information is available on the THP Tracking Center website.